What is restoration? Well, its big. It’s about people, money, policy, technology, history, biology, belief, and faith. Restoration is the primary mode of deliberate intervention in our environment to improve it, often taking a lifetime or more to fully unfold. It means that communities of people come together, define what they want to change, and then go about trying to change it as the technology, money, and effort will allow. The magnitude of this enterprise became visible to me at the Society for Ecological Restoration Texas & Southwest Chapters meeting in Alpine Texas. I thank my hosts Gwen Thomas and Kelly Lyons for the invitation. I had never attended a regional restoration meeting. The meeting, deep in west Texas and far from airports (although remarkably accessible by Amtrak train) had a strong local emphasis. This afforded a view of the many associated concerns and interacting restoration efforts within one region. There were presentations on brush management to achieve grassland restoration, rare plant species translocations, region-wide efforts to restore populations of bighorn sheep and pronghorn, channel and spring engineering, removal of invasive pasture grasses with native seeding, forest thinning efforts, and creating a "green infrastructure" for large cities. Several of these efforts take place in similar, or the same, landscapes. What is striking to see in one day is the bewildering array of currencies by which we evaluate ecosystems. Some currencies may conflict--for example those who revile old world bluestem grasses as invasives vs. those who regard them as a decent forage and excellent soil stabilizers. Others view ecosystems predominantly through the lens of endemic plants and animals, game habitat, or even specific ecological processes. For some, the effects of burning or grazing are inherently good because they are regarded as natural processes. These visions often conflict, but it seemed for the moment that they could coexist and even complement one another. Restoration practitioners with varying interests were working, or at least thinking, together with the common purpose of making ecosystems better. We ought to be having region-level meetings everywhere. We should all be able to visualize the totality of our attempts to transform our landscapes. I had a couple of other epiphanies during the meeting, knowing that the substance of them will come as no surprise to many of you. 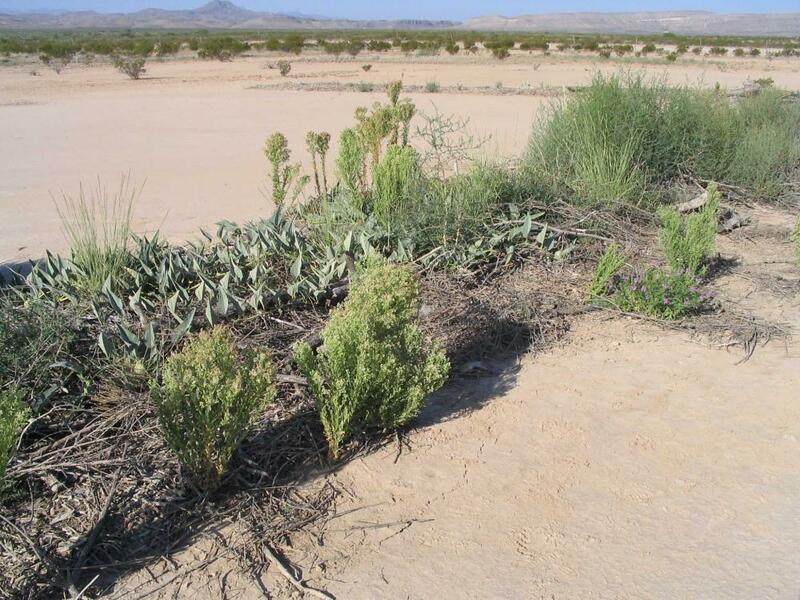 1) You can do a lot of restoration on Texas ranchland. Dr. Bonnie Warnock, of Sul Ross State University (who, not coincidentally, won the Excellence in Ecological Restoration Award) is doing some amazing work on the O2 Ranch with continued funding from the owners. Such arrangements facilitate long-term, adaptive restoration rather than the usual “restore and run” that seems typical of public lands where resources are stretched. 2) I overheard restoration practitioners lamenting the lack of a system for cataloguing, comparing, and learning about how the effectiveness of similar restoration actions vary with the contexts of climate and soils. I wanted to say, “Have you heard of Ecological Site Descriptions (ESDs)”. For those of you who don’t know what ESDs are, they comprise a land classification and information delivery system intended to do precisely what the practitioners described. I think most of them had heard of ESDs, but the truth is that ESDs do not yet adequately serve this function, nor are they, apparently, presented such that they are directly useful to many practitioners. I certainly believe in the potential utility of ESDs, but if we want them to be the go-to resource for land management and restoration, we have a lot of work, and imagining, left to do. Permalink Submitted by brunsonm on Thu, 11/06/2014 - 22:54. I've had the same sort of realization as you this past month, Brandon. I guess it wasn't a realization as much as a reinforcement of what I'd already noticed. I attended the Great Basin/Northwest regional meeting of SER in Redmond, Oregon, where people were sharing experiences succeeding at small-scale intensive restoration projects in the Puget Sound and Willamette Valley while we who work in the cheatgrass region were describing earnest efforts to restore native sagebrush-bunchgrass communities that sometimes feel like bailing water from a rowboat with a measuring cup in the midst of a tsunami. Two weeks later I was at the Univ. of Idaho Rangelands Center fall forum in Boise, where the topic was learning to adapt to cheatgrass. There we heard about firebreak networks and corriente cattle that learn to eat Bromus and medusahead. I'm not sure most folks at the SER conference would have been comfortable at the Idaho meeting, because it may have seemed like capitulation. But both represent honest and reasonable responses to a critical problem confronting western rangelands. My guess is that we'll need to continue experimenting with both approaches as we try to muddle our way towards sound rangeland stewardship in the Anthropocene. Permalink Submitted by Brandon Bestelmeyer on Fri, 11/07/2014 - 06:57. Great points Mark. It would be a great study to document the varying perceptions of primary restoration needs, goals and best strategies by ecosystem and perhaps by interest or membership in SRM vs. SER. Maybe an eminent social scientist in the natural resources field could tackle that :) I have also perceived a tension between different groups and it might be useful to describe those different views. Permalink Submitted by JaminJ on Fri, 11/07/2014 - 14:50. So far we have done a poor job describing why ESDs are valuable to practitioners. We tend to describe the value of ESDs using generalizations such as "help gain a better understanding of the ecology of this," or we over-promise an "increased ability to predict that." Such messaging may be fine when our audience is researchers and policy makers. But whenever I have talked to skeptical rangeland practitioners (including agency professionals and ranchers) about the value of ESDs, my experience has been that they relate much better to the message you have described above, that is, that the primary value of ESDs is a systematic way to catalogue, organize, and retrieve relavant information about particular practices on similar types of land to theirs. That's it! That should be the message we send to ESD users. It will require that those of us in the ESD world be more aware of our various audiences, and how each values ESDs differently depending on the way each group uses ESDs. Permalink Submitted by Brandon Bestelmeyer on Thu, 11/13/2014 - 12:49. Permalink Submitted by beldredge on Tue, 11/18/2014 - 10:05. I'm familiar with ESDs and their utility. However, knowing that information is only part of the equation. Landowners also need to know what types of approaches might work best for their site, even provide them with a menu of options. Currently, one has to do a lot of internet searching and often know key words in order to locate information on various restoration approaches. Therefore, we need a central resource where land managers can share and explore restoration approaches that have been successful in their region. SER has a section sort of like this, yet it lacks almost all of the approaches that I have seen in the Texas Hill Country, where I reside. There are many land-owners who tinker with new techniques (they might even be called citizen scientists) yet few others know about their successes and failures. We need to grow restoration beyond academia and an elite few natural resource professionals if we hope to see restoration happen on a much broader scale. An open-source and searchable database (or forum) will facilitate both idea exchange and experimentation. Permalink Submitted by beldredge on Tue, 11/18/2014 - 10:20. Here is a restoration practice using Keyline plowing. I found it by searching the internet for "Habitat Restoration" and "Keyline." Not sure how many folks have stumbled upon it. However, if it was shared in a more central forum or online database, it would be much easier to become aware of and promote. If you can recommend a site similar to what I am describing, I woud love to know about it!